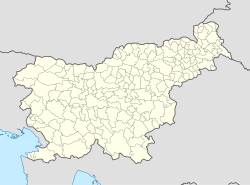 Krivo Brdo (pronounced [ˈkɾiːʋɔ ˈbəɾdɔ]; German: Kriv) is a small settlement in the hills between the valleys of the Poljane Sora and Selca Sora rivers in the Upper Carniola region of Slovenia. It lies in the Municipality of Gorenja Vas–Poljane. ^ Leksikon občin kraljestev in dežel zastopanih v državnem zboru, vol. 6: Kranjsko. 1906. Vienna: C. Kr. Dvorna in Državna Tiskarna, p. 58. This page was last edited on 23 March 2017, at 13:39 (UTC).